GAFFI (Global Action For Fungal Infection) today welcomes news from the World Health Organisation (WHO) that it has classed the disease known as chromoblastomycosis (see here for more information) - a disfiguring fungal disease of poor farmers in South America, Africa, and Asia - as a neglected tropical disease (NTD). Chromoblastomycosis also known as chromomycosis, is one of the most prevalent implantation fungal infections in tropical and subtropical regions around the globe. 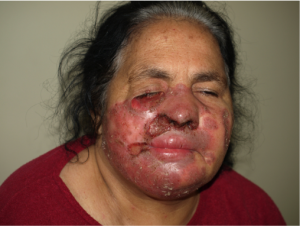 It is a chronic fungal disease of the skin and subcutaneous tissues, first described in the beginning of the 20th century from Brazil, Cuba and Madagascar. It occurs on a worldwide scale, particularly in rural areas and among poor men aged between 30 and 50. This chronic, mutilating disease is rarely fatal, but gross disfigurement and amputation of limbs is too commonly necessary. Inoculation of the fungus through the skin of plants or soil contamination leads to infection. Thus farmers, animal breeders and foresters are most at risk. The oil from the Babussu palm tree is used extensively in the beauty industry. However, the hard skin of the tree’s coconut is contaminated by a brown fungus that causes chromomycosis. When the skin is pierced by the tough coconut strands, a slowly progressive infection develops that becomes intensely itchy. Scratching leads to secondary body sites of infection, including the face. Many other plants carry the causative fungus, which are especially common in Madagascar and certain parts of Brazil. Medicines used for treatment for the majority of the poor are too expensive, and improved treatment availability is essential. Dr David Denning, Professor of Infectious Disease in Global Health at The University of Manchester, explains: “Most cases of chromo progress, and are rarely curative. Disfigurement and social exclusion are common. Sites most commonly affected are the lower and upper limbs and buttocks. Ear, face, neck and breasts have also been reported. Lesions slowly enlarge becoming verrucose and wart-like. Old lesions can be tumorous or cauliflower-like in appearance.